Marguerite Annie Johnson (Maya Angelou) was born in St. Louis, Missouri, on April 4, 1928, the second child of Bailey Johnson, a doorman and navy dietitian, and Vivian (Baxter) Johnson, a nurse and card dealer. Angelou's older brother, Bailey Jr., nicknamed Marguerite "Maya". Unable to pronounce her name because of a stutter, Bailey called her "My" for "My sister". A few years later, when he read a book about the Maya Indians, he began to call her "Maya," and the name stuck. Her parents divorced when she was only three and she was sent with her brother Bailey to live with their grandmother in the small town of Stamps, Arkansas. In Stamps, the young girl experienced the racial discrimination that was the legally enforced way of life in the American South, but she also absorbed the deep religious faith and old-fashioned courtesy of traditional African American life. She credits her grandmother and her extended family with instilling in her the values that informed her later life and career. 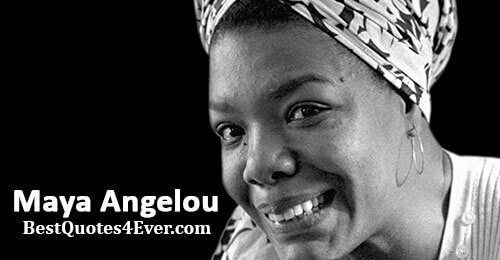 Writer and civil rights activist Maya Angelou is known for her 1969 memoir, I Know Why the Caged Bird Sings, which made literary history as the first nonfiction best-seller by an African-American woman. "I Know Why the Caged Bird Sings" is an account of her first sixteen years, altered somewhat for the sake of narrative clarity. For example, a few characters are composites of several people she encountered. In 1971, Angelou published the Pulitzer Prize-nominated poetry collection Just Give Me a Cool Drink of Water 'Fore I Die. She later wrote the poem "On the Pulse of Morning"—one of her most famous works—which she recited at President Bill Clinton's inauguration in 1993. Angelou received several honors throughout her career, including two NAACP Image Awards in the outstanding literary work (nonfiction) category, in 2005 and 2009. In 1952, she married a Greek sailor named Anastasios Angelopulos. When she began her career as a nightclub singer, she took the professional name Maya Angelou, combining her childhood nickname with a form of her husband's name. Although the marriage did not last, her performing career flourished. In New York, she fell in love with the South African civil rights activist Vusumzi Make and in 1960, the couple moved, with Angelou's son, to Cairo, Egypt. In Cairo, Angelou served as editor of the English language weekly The Arab Observer. Angelou and Guy later moved to Ghana, where she joined a thriving group of African American expatriates. She served as an instructor and assistant administrator at the University of Ghana's School of Music and Drama, worked as feature editor for The African Review and wrote for The Ghanaian Times and the Ghanaian Broadcasting Company. During her years abroad, she read and studied voraciously, mastering French, Spanish, Italian, Arabic and the West African language Fanti. She met with the American dissident leader Malcolm X in his visits to Ghana, and corresponded with him as his thinking evolved from the racially polarized thinking of his youth to the more inclusive vision of his maturity. 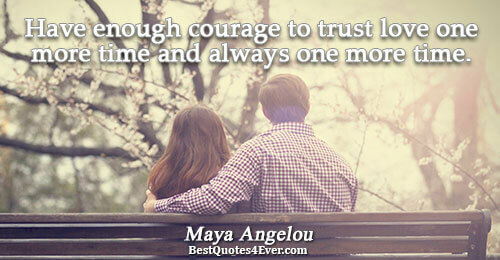 Angelou married Welsh carpenter and ex-husband of Germaine Greer, Paul du Feu, in San Francisco in 1973. 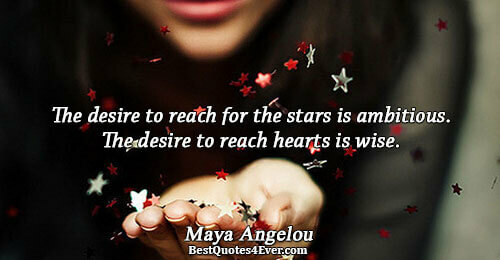 Over the next ten years Angelou had accomplished more than many artists hope to achieve in a lifetime. 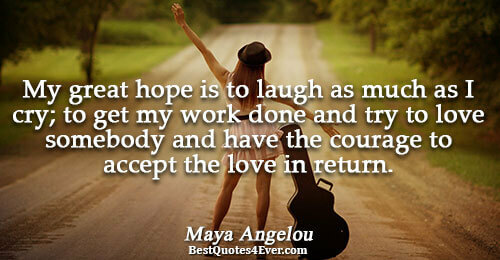 Angelou worked as a composer, writing for singer Roberta Flack, and composing movie scores. She wrote articles, short stories, TV scripts, documentaries, autobiographies, and poetry, produced plays, and was named visiting professor at several colleges and universities. 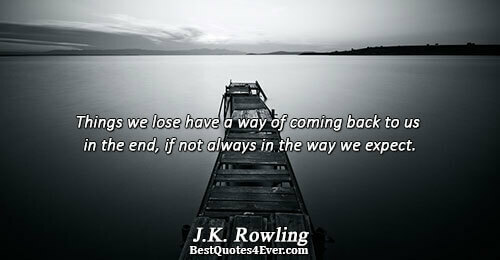 She was "a reluctant actor", and was nominated for a Tony Award in 1973 for her role in Look Away. As a theater director, in 1988 she undertook a revival of Errol John's play Moon on a Rainbow Shawl at the Almeida Theatre in London. The list of her published works includes more than 30 titles. These include numerous volumes of verse, beginning with Just Give Me a Cool Drink of Water 'Fore I Die (1971). Books of her stories and essays include Wouldn't Take Nothing For My Journey Now (1993) and Even the Stars Look Lonesome (1997). She continued the compelling narrative of her life in the books Gather Together in My Name (1974), Singin' and Swingin' and Gettin' Merry Like Christmas (1976), The Heart of a Woman (1981), All God's Children Need Traveling Shoes (1987) and A Song Flung Up to Heaven (2002). 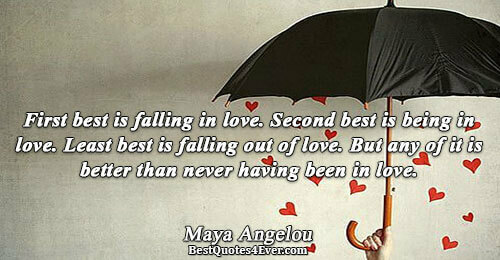 Maya Angelou died at home on May 28, 2014, in Winston-Salem, North Carolina. 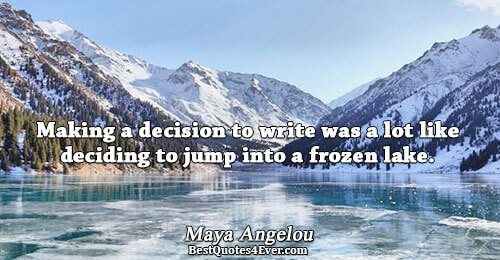 Making a decision to write was a lot like deciding to jump into a frozen lake. I don't trust people who don't love themselves and tell me, 'I love you.' ... There is an African saying which is: Be careful when a naked person offers you a shirt.